A new study out of the University of Edinburgh has found that two major glaciers in Antarctica are melting much more quickly than thought. Two major glaciers spanning 150 miles in Antartica are collapsing, an alarming new development ont he front lines of global warming. 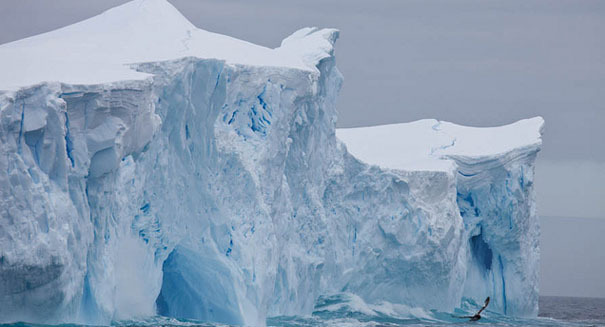 The Thwaites and Pine Island glaciers in a remote part of the continent called Pine Island Bay are melting very quickly, according to a new study. The glaciers will most assuredly melt, the question is when. And when they do collapse, it could flood coastal cities and shorelines with water, and leave millions of people homeless. That’s because these glaciers are on solid ground and not floating in the ocean, so the water they contain would be a straight net increase in sea levels. And the sea level rise would be massive, increasing an estimate 11.2 feet. Scientists originally thought it may take thousands of years for these ice sheets to melt, but the new evidence from this study indicates it’s possible this could happen in decades.